Mary Chia, the leading beauty and wellness spa brand in the industry, invites all Malaysians to Shape Up with Mary Chia, through its revolutionary 360° Complete Transformation which is a revolutionary approach to weight management, that guarantees at least 2kgs weight loss in just 2 weeks! Hailing from Singapore, Mary Chia has accomplished more success stories than any of its counterparts. With over 30 years of experience in the industry, the award-winning brand is the leading provider of premium and quality beauty, slimming and spa services for men and women alike. Backed by a highly experienced team of professionals and doctors, Mary Chia offers only the best for customers who strive to be the best they can be. Currently there are six Mary Chia face, body and spa centres in Malaysia, and one aesthetic clinic, MCU Beautitudes, which combines the latest cutting-edge technology with medical expertise to deliver unsurpassed results. To date, the experts at Mary Chia have since helped more than 500,000 individuals achieve the figure of their dreams. Understanding the need for a holistic weight management programme that is relevant to the lifestyle of modern women, Mary Chia is proud to introduce the 360° Complete Transformation approach. Because every woman is built differently, there is no ‘one size that fits all’ solution when it comes to achieving one’s dream physique. The 360° Complete Transformation programme integrates FIVE different ways to help you shape up quickly and effectively, without having to resort to desperate measures like popping diet pills or torturing yourself with unattainable targets or crash diets. Each way of the 360° Complete Transformation approach is personalised according to the individual’s requirements after a thorough assessment by Mary Chia’s professional and experienced consultants, in order to create a realistic, sustainable and safe weight management programme. Detoxification: stimulates the body’s lymphatic drainage system and purifies the body of accumulated impurities. Cardio Stimulation: enhances blood circulation and revs up the body’s metabolism so that it continues to burn fat even after the treatment. Targeted Sculpting: a set of treatments that target and break down fat in specific areas of the body for smooth, desirable body contours. Cellulite Combustion: through precision kneading, cellulite composites are broken down for a smooth, flawless appearance. No more unappealing orange-peel skin effect. Water Retention Reduction: a combination of deep-sea marine mud and thermal stimulations relieve the body of excess water while enhancing the kidneys’ functions. It’s no secret that every woman is plagued with the problem of losing weight, especially after giving birth. Natasha Hudson, well-known Malaysian model, award-winning actress, celebrity blogger and singer, gave birth to her second child, Naeema Khaleela, 5 months ago. Despite multiple attempts to lose the post-baby weight, she finds it impossible to lose the extra fat around her abdomen and hip area. “I first heard about Mary Chia from my friends after giving birth to my second child. What attracted me is their new approach to weight management, which is why I decided to give it a try. I am glad I did as you know; my heaviest weight record was 65kg! I’ve tried all sorts of methods to lose weight, but so far nothing has worked for me. That’s why I’m pretty excited to take on the Shape Up with Mary Chia challenge, so I can regain my pre-baby figure! 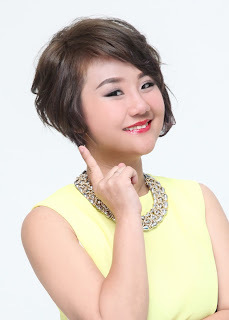 I am currently 51kg and I have lost 6kg in 3 weeks since I started with Mary Chia,” says the affable beauty. Natasha will attempt to lose another 2kg in just 2 weeks with Mary Chia. For Singaporean actress Chen Liping, it was her love for delicious food combined with a hectic work schedule that earned her the title of a ‘heavyweight’ artiste. Easily recognised due to her chubby physique, Liping decided to accept Mary Chia’s challenge to lose weight through its 360° Complete Transformation approach when her weight began to take a toll on her work performance. “I felt breathless on set, and I knew I had to do something about my health,” she shares. True enough, in just 3 weeks, Liping, who previously tipped the scales at 73kg, lost a whopping 6kg! Three months later, the Liping’s weight loss is at an astonishing record of 12kg. Having dropped 3 sizes from XXL to M, the actress is extremely satisfied with the results, and is fully embracing her new, slimmer, healthier self. “After experiencing Mary Chia’s treatments and its revolutionary 360° Complete Transformation approach, I’m now more aware of what my body needs. I can still eat my favourite shabu-shabu, but now I opt for lean meat instead of the fattiest piece on the plate!” she laughs. 7 times of treatments from the 360° Complete Transformation series of treatments, which includes treatments from detoxification, cardio stimulation, targeted sculpting, cellulite combustion and water retention reduction. 6 supporting programmes with Mary Chia’s dedicated team of professional consultants to help you achieve your target shape or weight easily with expert consultations, customised programmes, weight-loss monitoring and personal motivation. After signing up, you will be in the running to win additional prizes through a contest. Take on the challenge and see a 360° Complete Transformation in yourself! To top it off, Mary Chia is offering a guarantee of at least 2kg weight loss in just 2 weeks, or you’ll get your money back! 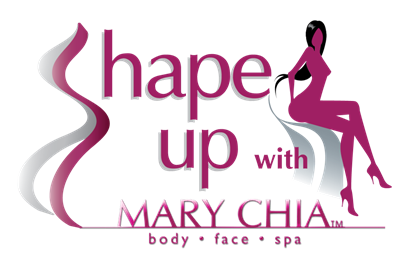 Shape Up with Mary Chia now to get the right curves faster, healthier and smarter. For more information on “Shape Up with Mary Chia” challenge and a free trial to experience the 360° Complete Transformation weight management programme, visit www.marychia.com/shapeup or www.facebook.com/MaryChiaMalaysia. Interested individuals can also visit Mary Chia outlets located at The Boulevard Mid Valley City, Tropicana City Mall, Sunway Pyramid and One Utama in Klang Valley; and Sutera Mall and Plaza Pelangi in Johor.